I recently got this amazing coat from Jollychic, if you don't know this shop they sell a lot of amazing things for affordable prices! The choice is so large I'm sure you'll find something you like, there are so many amazing things it's really hard to choose (my favorite sections are leggings, coats and sweaters)! 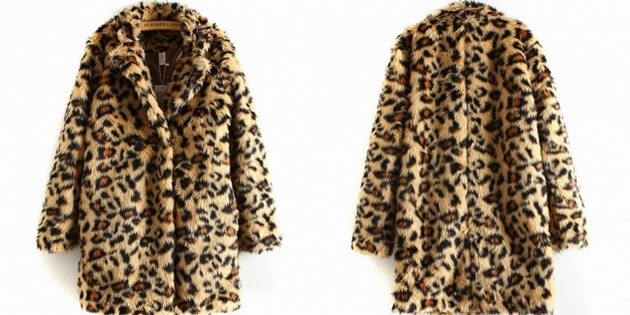 As you already know I'm a big fan of leopard prints, I have in my closet tons of clothes and accessory but I miss in my collection a fur long coat, so when I saw this one my heart screamed like a crazy! I was really surprised how amazing the quality is, the fake fur is really soft, I absolutely love it! The material is so warm I have no problem to wear it also with this freezing weather. I love how it fits perfectly and how it's versatile, I can wear it with a lot of different things in my closet! I chose an s size , it's not too tight so you can wear thick clothes under it. If you are a leopard-addicted like me I'm sure you'll love it! And also some outfit pictures without the coat! The customer service is also wonderful, they are really kind to answer all of your questions and I got the parcel in a few days! There is also Free Express shipping worldwide for order over 99$! I absolutely recommend Jollychic, I love their service and their products! Let me know if you already bought something from them! I like your coat. *w* So cool. wow so trendy and pretty! Must be super cosy and warm!! Also I really love the outfit you wore! Dark but feminine and cute.